The Scenicland Rally is now behind us. By all accounts, it was a tad different to the last couple of years weather and route wise, but as Club Captain Colin reported, after a “chapter of events’ it was an enjoyable day and evening function. Probably the type of Rally that the Coast always used to hold, when the majority of vehicles were built for those roads. NEW MEMBERS We welcome Tony and Carleen Keane, Hokitika to the Branch. They own a 1971 Vauxhall Victor Saloon and we look forward to meeting up with them on our Club runs and social events. We have been fortunate to have a few new members in recent months, note the AGM is in June and it is a good occasion to meet up with each other. APRIL CLUB RUN You will note that the Committee have decided not to hold a Club Run this month owing to Easter and Anzac Day being in close proximity as well as other events being held in the South Island which involve some members. There will be a run in May. But don’t forget the monthly coffee morning get togethers at Shantytown, our numbers have dropped off slightly lately, maybe you are forgetting or are busy. School holidays always affect us too, but there is always someone there looking forward to a chat and catch-up. AGM Is to be held at Kumara Junction Café on 9th June. As always all positions are vacant at the meeting. Allan has done two years as our Chairman and Colin has had three years as Club Captain and they have decided to stand down. The position of Secretary is up for grabs and it would be fantastic if somebody would put their hand up for the position, I am only too happy to help out as there is a wee bit to learn. It is not a hard position but can take a bit of time now and again. We really need new blood on the Committee as those that are there have given their time and now would like a break. All these positions are a great way to get to know our members and help keep our Branch running smoothly. THINK ABOUT IT PLEASE. NATIONAL AGM You will note that we are hosting the National Annual General Meeting in August. Planning is underway and it is being held at the Ashley Hotel in Greymouth. Delegates from all over New Zealand will be coming along and we will be seeking support from members for transporting to and from Hokitika airport as well as various other activities that weekend. Most attending will be involved with the meeting but any partners who have come along will be taken on a tour around the area and it is always nice to have some locals join in. This AGM is open to all members and we would be delighted to have our Branch represented. EVENTS ELSEWHERE WHEELS at WANAKA – Easter Weekend 2019 To be held on Saturday 20th and Sunday 21 April. The website is www.wheelsatwanaka.co.nz or www.facebook.com/wherelsatwanaka. 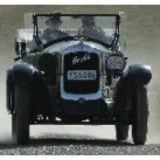 Preliminary Notice – Veteran & Vintage Tour to start Ashburton 6th May – Finish Hanmer Springs 13th May. Details will probably be in the next Beaded Wheels which is due out very soon but to travel through the Haast Pass. Expressions of interest to Diane Ross email: randross@kinect.co.nz or ph 03 308 2356. 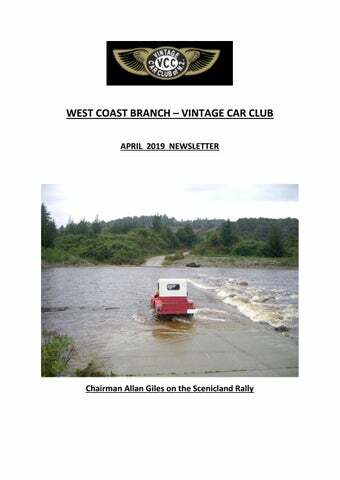 SOUTH ISLAND EASTER RALLY … 19th to 22nd April 2019 – Ashburton Branch 50th Anniversary. I now have entry forms for the above Rally. Please contact me if you would like one. We now have a smaller group travelling to Ashburton owing to a withdrawal. PLEASE NOTE – If it is not suitable to you to use your Club eligible vehicle on the Branch runs, you are more than welcome to come along in your modern as we welcome your company. SERVICE BADGES – To those members who are nearing 25, 35 or 50 years membership, please contact Membership officer David Campbell. You are entitled to a service badge for your continued membership. Check out the date you joined the Vintage Car Club. NAME BADGES – Also, please contact David Campbell if you would like a name badge. The Branch supplies your first one. VERO INSURANCE - If you take your Insurance out with VERO they will then pay the Branch a small Commission which helps with Branch finances. Please note that when applying for Insurance cover with VERO you must quote the Branch number which is 36 plus your membership number. Also you are reminded that this scheme is set up for financial members only.